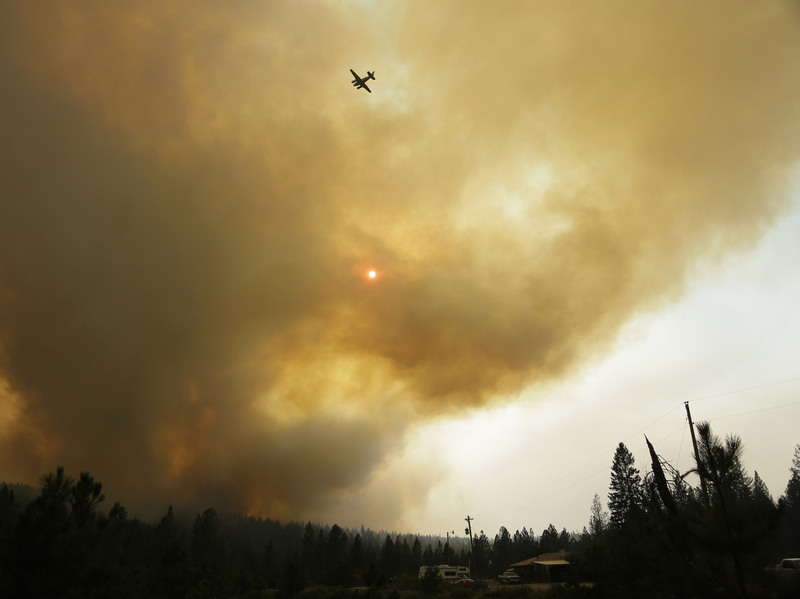 Worsening Wildfire Seasons Tax The Forest Service The agency says it's now spending record amounts on fire suppression, and these bills are coming at the expense of its other programs — many of which would help prevent future wildfires. 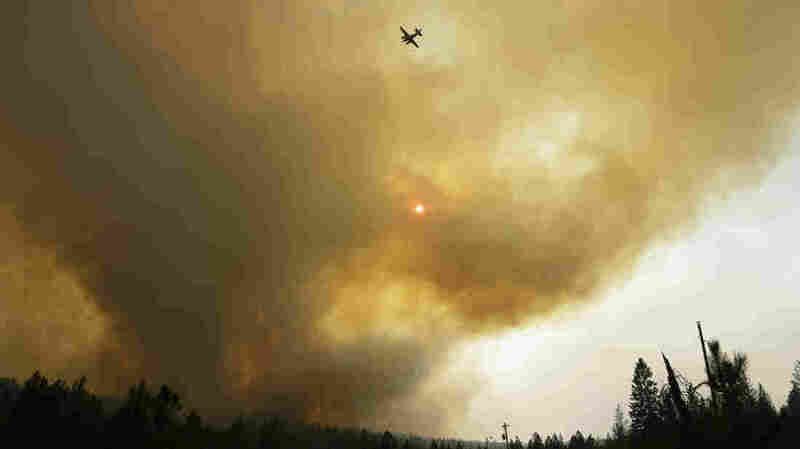 An airplane used to fight wildfires flies over a blaze that flared up near Omak, Wash., on Thursday. "These large and intense fires are a natural disaster in much the same way a hurricane or a tornado or a flood is," U.S. Agriculture Secretary Tom Vilsack says. "And they ought to be funded as such through the emergency funding of FEMA." But behind what seems like another battle over which agency should pay for what, is something much bigger and more complex. The U.S. Forest Service, part of the Agriculture Department, simply isn't set up to deal with these new types of mega-fires that are transforming the West. To understand this, remember that wildfires have been intertwined with the Forest Service since just a few years after it was created. The summer of 1910 was later characterized as "The Big Blow Up." Coincidentally, like this year, the worst fires then were in the Northwest and northern Rockies, where more than 3 million acres burned and at least 85 people died. In the years after, the Forest Service implemented its now infamous "10 a.m. policy." Every wildfire had to be put out by 10 a.m. the following day. "There are a lot of people who refer to the U.S. Forest Service as the 'U.S. Fire Service' because fire has become such a part of their mission," says Michael Kodas, a wildfire expert at the University of Colorado. "Part of the problem here is, basically, overly ambitious expectations of what the Forest Service and what our wild land firefighting organization overall can really accomplish." Kodas says. It's now widely known that prior wildfire suppression policies are partly to blame for the current conditions. Yet the impacts of the worsening wildfires on the agency's budget are telling, if startling. "All of a sudden somebody's going to be sticking a camera in there almost forcing the issue, socially and politically, that we take some kind of action to try to protect these places," Mangan says. "And that generally involves an awful lot of expense." In Oregon on Friday, Agriculture Secretary Vilsack warned that the federal government is already spending more than $150 million a week fighting wildfires. 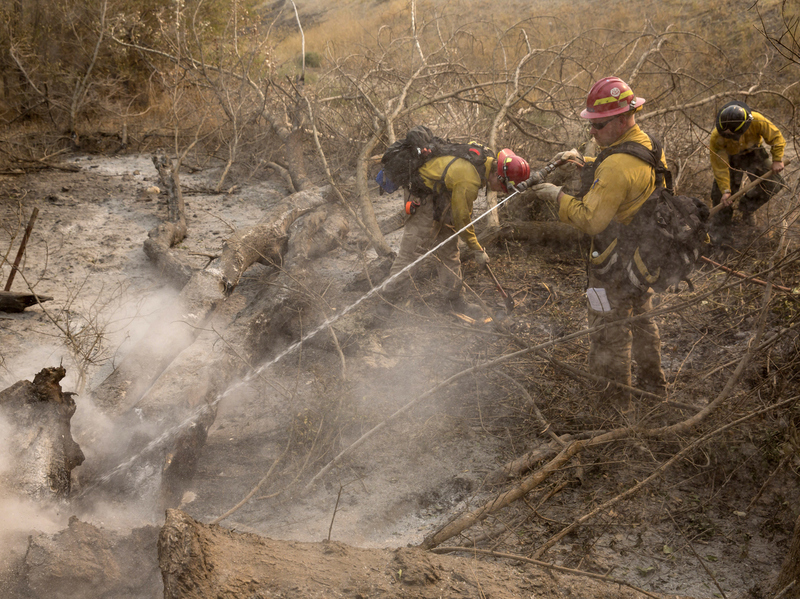 The Forest Service says federal, state and local fire teams typically control all but 2 percent of the tens of thousands of wildfires that ignite every year. It's that last 2 percent that can turn into the big, catastrophic blazes such as Washington's Okanagan Complex fire. "At the same time, members of Congress and senators come to us and say, 'We want more work being done in our forests, we want more timber treated,' " Vilsack said. But wildfires are still relatively small natural disasters compared with a big hurricane or earthquake. There's widespread doubt that Congress will act on changing fire budgets this summer, so the Forest Service may be stuck as the "Fire Service" for some time.